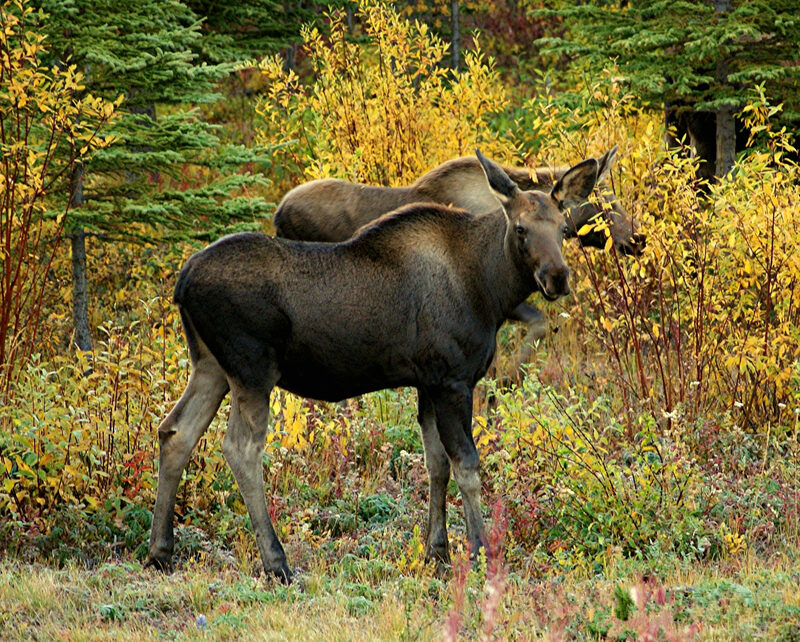 One management goal in the Boreal forests of Alaska is to maintain habitat diversity to support wildlife, such as the mother and baby moose pictured here. Wildfire across North America—particularly in Alaska—has become more severe, intense, and frequent in recent decades during a time of climate warming and drying. While it’s nearly impossible to create an optimum wildlife habitat mosaic by managing wildfire under these intensifying conditions, appropriately planned forest harvest management can create desirable landscape patterns at a useful scale. A new framework developed by researchers at Bonanza Creek LTER provides an important tool for implementing adaptive forest harvest management under rapid climate change. The framework considers climate uncertainty, public safety related to fire regimes, and harvest and biodiversity goals. Based on research findings and using an adaptive management approach, the researchers present flow-charts of recommended practices under conditions of the recent past which will continue to apply in some landscapes and under continued change in landscapes with climate-sensitive forest types. The research team identified options for adaptive boreal forest management practices based on a warming climate that fall into three categories: maintaining current species of harvestable trees, maintaining a forest landscape of any type, and supervising biome shifts from forest to other biome types such as scrubland. Depending on which suite of options is desirable, forest managers can decide how intensively they need to intervene in fire regime management and forest repopulation after harvesting. For example, timber production systems based on white spruce are likely to face sustained yield challenges unless intensive practices, such as fire protection and repeated planting, are applied. Conversely, where early successional hardwood systems are preferred, natural regeneration may be adequate. Climate change as an issue confronting forest management has evolved from a distant prospect to an unfolding reality as it is being experienced in boreal Alaska. This new adaptive management framework for Alaskan Boreal Forests synthesizes knowledge and practices of the past to meet the needs and challenges today, and to help prepare for a future of rapid change. Miho Morimoto, Glenn Patrick Juday. 2018. Developing Adaptive Approaches to Forest Harvest Management in Boreal Alaska under Rapid Climate Change, Journal of Forestry: 116(5): 437–450.